The beach huts are finally in! With lots of much appreciated help we have managed to get all 9 huts onto the land, including the chickens that live in them. There’s a fair bit of repair and adjustment to be carried out to make them more usable for our purposes, but the logistical challenge of moving them all has been accomplished. All our outdoor runs now need to be sorted ready to let our birds run in much bigger areas. They have been confined to small, netted areas, due to the restrictions that were in place because of the Avian Flu outbreak. Until recently, one half of our chicken area had pigs living on it. These have been moved and in a rare dry moment I managed to cultivate over it in an attempt to flatten the area ready for some grass seed to be sown. If you look closely you can just see Sky feeding her latest litter of piglets outside as the day was beautifully warm. Our 3 main breeds for egg laying will live in this area, but their houses are yet to be constructed! Our land is situated on a slope, and any rainfall or water run off from the road will head very quickly down the slope to the stream at the bottom. As it rushes down it takes with it minerals from the soil depositing them at the very bottom of the field. All our Veg beds at the top of the field are raised in an attempt to slow down this water flow, and it does work but there’s a lot more we want to do, not only to stop the loss of minerals, but to preserve the water we have and use it well. To this end we had planned to bring a digger onto the land in the Autumn of 2015, to begin putting in some water “features”. We want to build in at least 2 Swales, 5 Ponds and 1 Earth Tank. However with the incredibly wet Autumn we’ve had that has been impossible, and without these measures in place the field has flooded in certain areas. In an attempt to alleviate the problem we have decided to begin work on some of the overflow channels that will join some of the ponds and swales together. These should help to move the water away from the more used areas of the field to places where flooding won’t affect us too much. This is the first overflow channel that we started yesterday evening. It’s in no way finished, but just look at the amount of water in it from the rainfall last night! Just need a few dry days to continue this channel on down the field to a small storage pond. 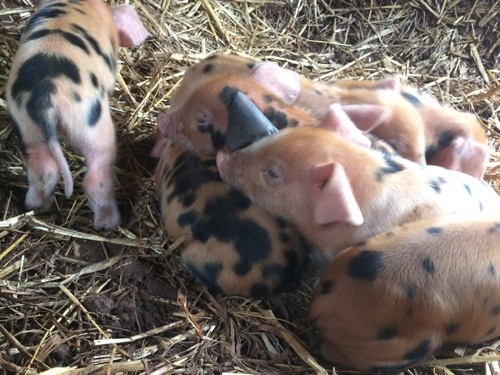 On the 28th December Missy finally had her first litter of Piglets. We were beginning to think that there was a problem with her and to be honest this was her last chance. A sow eats a lot of food, especially one as large as she is! She’s a pedigree Oxford Sandy and Black and she is now the proud mother of 8 healthy piglets. They all seem to be doing well and Missy is a very good mother. 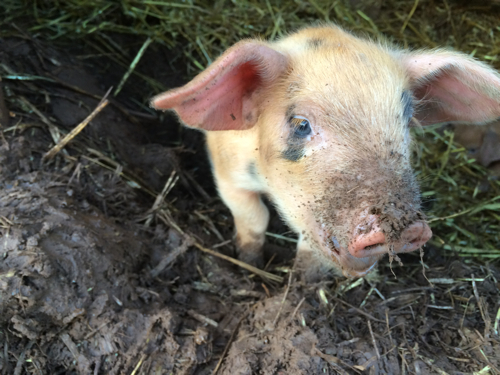 At a week old they’re just beginning to venture outside – that’s where the fun begins for Missy! Growing Food to Give Away!